Ball Pein hammer, 2oz. Head is 52 mm. Ball Pein Hammer is used for shaping, flattening and removing ..
Chasing Hammer The BEADSMITH 2.7cm Head, 27cm length. 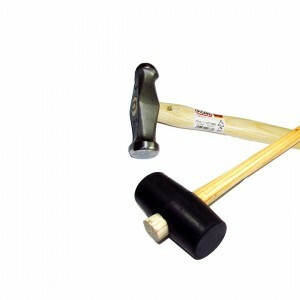 This hammer features a smooth, slightly convex..
DELUXE RAWHIDE MALLET, SIZE 0 (2OZ), 1" FACE Designed to prevent scratching or marring of ..
DELUXE RAWHIDE MALLET, SIZE 1 (4OZ), 1.25" FACE. Designed to prevent scratching or marring of th..
DELUXE RAWHIDE MALLET, SIZE 2 (6OZ), 1.5" FACE. Designed to prevent scratching or marring of the..
DELUXE RAWHIDE MALLET, SIZE 3 (9OZ), 1.75" FACE. Designed to prevent scratching or marring of th.. The hammer is 13 inches long with a 2 inch head, the head is made of Nylon while the handle is made .. The Planishing Hammer is for smoothing metal. The flat side will refine the hammer marks from the ro.. Plastic + Rubber Hammer. This lightweight Plastic-Rubber Jeweler’s Hammer features two differen..